A trio of cabins in Longyearbyen and the Gruvebadet building in Ny-Ålesund are facing major structural threats due to heavy rains earlier this month. The cabins on the road to Bjørndalen are in danger of falling into the sea due to severe erosion that occurred during the storm, with two considered at risk if even one major storm occurs unless they are moved inland, according to an inspector with the Norwegian Water Resources and Energy Directorate. Officials with the city and Store Norske, which owns the property, agreed this week to find a new location for the two cabins but expect they are not in immediate danger due to colder weather stabilizing the ground. Gruvebadet, an ancient mining bathhouse that was refurbished into a research facility in 2013, is in danger of collapse due to the ground sinking as much as one meter under parts of the building following the rain. 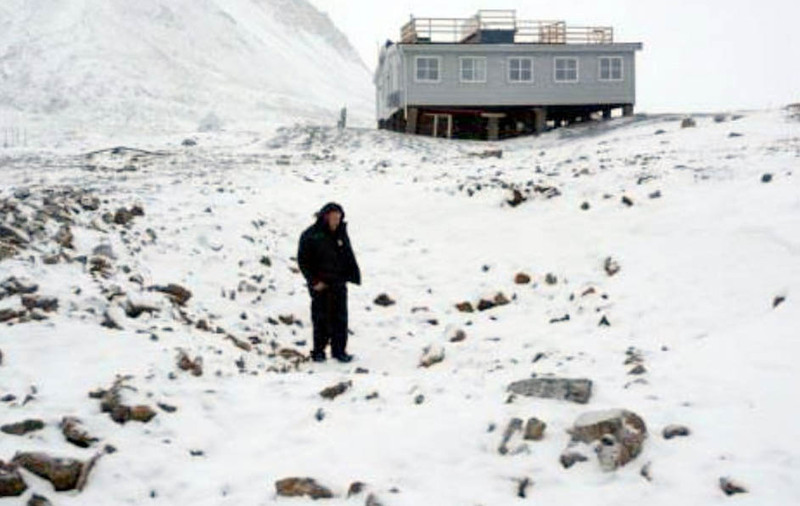 Officials in the settlement have obtained permission from The Governor of Svalbard to remove the unstable material and replace it with a more solid stone surface with a concrete foundation. The work is being performed before winter in order to ensure the building doesn’t sink further before the ground freezes. A much-watched polar bear with the rare distinction of giving birth to triples – for at least the second time – has again lost two of the three cubs before they were a year old, according to Jon Aars, a researcher at the Norwegian Polar Institute. The mother and her cubs were observed by numerous residents and visitors in Tempelfjorden this spring, when the animals were able to feast abundantly on seals due to a good sea ice cover. The family moved northward and then east to Nordaustlandet during the summer, but the mother recently returned to Tempelfjorden – with only one cub in tow. Aars said it’s rare for all three triplets to survive, with at least one cub usually dying fairly rapidly. Hunger is the leading cause, since the mother will let her cubs fight among themselves for nourishment when they are nursing. The female bear also was seen with a set of triplets in 2011, but two of the cubs also died during their first year.